Chlorine emanating from the Greek word 'χλωρóς' (khlôros, meaning 'pale green'), is one of the most commonly used disinfectants for water disinfection. Chlorine can be applied for the deactivation of most microorganisms and it is relatively cheap.Chlorine has been used for applications, such as the deactivation of pathogens in drinking water, swimming pool water and wastewater, for the disinfection of household areas and for textile bleaching, for more than two hundred years. Chlorine also plays an important role in medical science. It is not only used as a disinfectant, but it is also a constituent of various medicines. The majority of our medicines contain chlorine or are developed using chlorine-containing byproducts. Medical herbs also contain chlorine. The first anaesthetic used during surgery was chloroform (CHCl3). The chemical industry creates ten thousands of chlorine products using a small number of chlorine containing chemicals. Some of the products which contain chlorine are glue, paints, solvents, foam rubbers, car bumpers, food additives, pesticides and antifreeze. One of the most commonly used chlorine-containing substances is PVC (poly vinyl chloride). PVC is widely used, for example in drainpipes, insulation wires, floors, windows, bottles and waterproof clothes. About 65% of industrialized chlorine is used to produce organic chemicals, such as plastics. About 20% is used to produce bleach and disinfectants. The remaining chlorine is used to produce inorganic compounds from chlorine and several different elements, such as zinc (Zn), iron (Fe) and titanium (Ti). Real-time, online water quality monitors, analyzers and controllers are also used to measure levels of chlorine in water and wastewater. 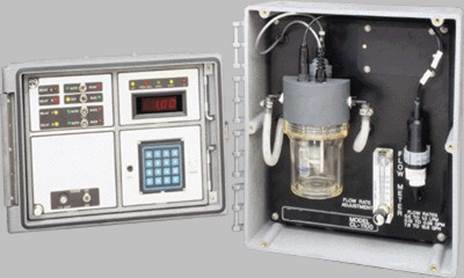 Reagent-free Measurement.This microprocessor-based measurement system uses a unique combination of pH, temperature, and chlorine sensor inputs to produce highly accurate, reliable measure-ments - without using costly reagents - in applications where the process does not exceed 8.5 pH. This system automatically compensates for the infuences of temperature and pH, providing highly accurate chlorine measurements. Four 4-20 mA outputs can be independently set up to track any of these measured parameters. Replaceable Chlorine Sensor Membrane Cap. 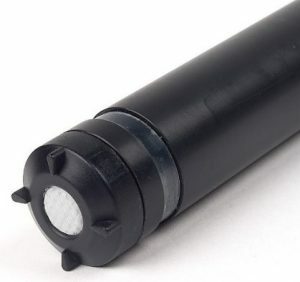 The chlorine sensor has a unique membrane cap to ensure repeatable measurements and simplify maintenance. The pre-plumbed sampling assembly, housed in a NEMA 4X enclosure along with a built-in flowmeter and adjustable flow rate control, greatly simplifies installation and operation. Built-in passcode access, when enabled, prevents unauthorized alteration of stored values while allowing an operator to recall any setup value. Four solid-state relays provide dedicated control and alarm functions for free residual chlorine and pH. Adjustable relay setpoints and deadbands, and selectable operating modes that respond to increasing or decreasing reading provide configuration versatility to meet your application requirements. Add-on Accessory for High pH Applications. A special pH buffering system is available for applications where the process exceeds 8.5 pH. The buffering system has a flow-thru housing assembly and solid buffer cartridge which eliminates the need for pumps, valves, and tubing that liquid-type buffering systems require. Sampling assembly weight 6,8kgs approx. Our free chlorine sensors provide a direct measurement of free chlorine in parts per million (ppm). Using field tested amperometric technology, our sensors perform continuous monitoring without any additional reagents. With a direct 4-20mA output, the sensors can be used with any instrument accepting a 4-20mA input or connected directly to a PLC or SCADA. The Controller with integrated signal processor embodies many features and performance capabilities employing advanced technology for stable, drift free readout, while incorporating features that provide flexibility for both present and in the future with plug-in easy upgrade option cards. The unit has two inputs, 0 to 20 (4 to 20) mA DC or 0 to 10 VDC, and a built-in 24 VDC supply to power remote transmitters. The controller also incorporates a 16-point input scaling feature for compensation of non-linear processes. 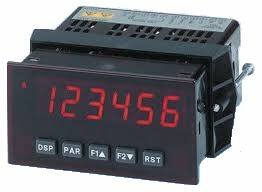 The signal totalizer (integrator) can be used to compute a time-input product. This can be used for various applications, i.e. to calculate service intervals of motors and pumps, etc. The controller has been specifically designed for harsh industrial environments. With NEMA 4X/IP65 sealed bezel and extensive testing of noise effects to CE requirements, the meter provides a tough and reliable local readout. Plug-in cards also facilitate bus communications. These include RS232, RS485, USB, Modbus, Profibus, DeviceNet. 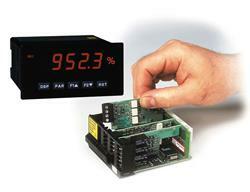 Additionally, the display has features that allow a remote computer to directly control the outputs of the unit. This is useful during commissioning phases and diagnostic use. With a communication card installed, set-up software allows configuration from a PC. The configuration data can be saved to a file for later recall.